Today we went on a bunch of errands. We left the house at 10:50 and didn’t get home until 5:30. First we went to get NHL’s hair cut. NHL is getting better (sort of) with the hair thing, but is still very frightened by the sound of the clippers. While waiting for his turn a weird woman walks up and comes down to the ground where I am sitting with JSL in his carrier. She asked if she can SMELL the baby. Before I can nicely say NO she sticks her nose into his carrier to smell him and exclaims “Yup, still has that newborn smell!” I swear all of the weirdos were at the hair place today! After that we stopped at a local candy store to get NHL a lollipop since they no longer give them out at the hair place. Then we went to lunch out. JL and I had a craving for salad so we went to Golden Corral since that fit the bill. At the end of the meal JSL woke up from a nap and was VERY hungry. I left and since it was cooler today I was able to nurse him in the back of the van. Next we went to the mall. JL insisted on this since he wanted me to take my engagement ring to the jewelry store there to get it fixed. Note this for later. Basically my diamond setting isn’t holding my stone correctly and needs a new head (it wiggles – no relation to –> ). So I wanted to find out when they could do it and get it done before something happens. We parked by Sears and poor JL had the million diaper changes with JSL. NHL and I left after the second one in as many minutes and went to the Christmas Tree Shop. Here we found great buckets for the pool, dinosaur flash cards and some other cute things. Then we went to look at EB for Wii things (didn’t get anything today). After that we went to the jewelry store. JL went ahead of me with NHL. Out of the corner of my eye I see him handing over a slip of paper (a receipt) for something. Then they go and retrieve something. I quickly caught on, but continued on my mission of asking about my engagement ring fix. Basically for a new platinum head that will be custom fit for my diamond will run us $200. Still it really isn’t an option since it will cost us more IF something happens to my ring and we need to make a claim on the insurance policy. So this week they will call me to come in and do it while I wait instead of keeping it for 10+ days. SO back to JL’s little secret. He gives me the little box and tells me Happy Mother’s Day and Anniversary! 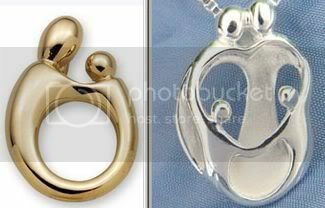 I open it up and it’s a Mother and Child pendant. Something that I had once mentioned I was very interested in some day, but didn’t need now. The first thing I did was to smack him (it was a love smack) and tell him I didn’t need it. Then I noticed it was yellow gold and questioned that. I now feel bad about seeming ungrateful, but the entire thing was very awkward in the middle of the store. Anyway, it really is beautiful. The picture below of the yellow gold pendant is what he got me, only mine has a peridot (for NHL) and emerald (for JSL)in them for each of the boys. Also below is a picture of the necklace that my mother got me after I had JSL. I had never seen anything like it before. It’s a family one with two parents and two children. BTW – JL had me fooled on the present. He was talking about getting me a new digital camera for this present since mine died. Apparently he went to lunch at the Cheesecake Factory with two of his co-workers and the lady in the geek patrol convinced him to get it. Sneaky devil isn’t he? Out last stop in the mall was to Pay Less Shoes. For the first time (I think) NHL has worn out a pair of shoes before completely outgrowing them. So we went there to look for some new sneakers. They had a pair he really liked, but they didn’t have his size (they fit, but barely had growing room). We got them to put a hold on a pair of them in his size at the other mall. Then JL found a pair of sandals and we got those for him. Finally it was time to head out of the mall. Our last stop before home was my parents house to feed their cockatoo and fish. While there I fed JSL. Then we packed up and went home where JSL was hungry yet again (damn growth spurt is killing me). Eventually we got both of the boys into bed and watched some Mork & Mindy Season 1 (from the library) before JL made some granola bars and is playing with the Wii. He best be more careful since he is now bleeding from smacking his hand while “playing tennis” and hit my laptop as I sit here typing this. On that note I think I am off to bed. I have a feeling JSL will be up . . . maybe now since I hear one of the boys stirring now. Hi there. I noticed your post about shopping at a Christmas Tree Shop. I work at a little ad agency in Ohio & we’re trying to find out more about the people who shop there … any chance you’d take a minute to fill out a quick survey? Maybe even share it with friends who shop there? The link is below … we don’t ask any personal information or track anything – we’re just want to know more about how you shop.